Some of the wonderful comments that the flowersmiths delighted customers have to say. Some of the very kind words from our clients.......We love receiving them thank you! Thank you so so much for the beautiful flowers in the venue. They were incredible - I couldn't believe how beautiful they were, they were just perfect! The thought and time you had put into them was clear, not only to myself and Charlie but to all the guests as well. Thank you so much. When we've recived our photos I will be sure to send some over to you. We just wanted to say how much we loved every single flower arrangement you put together for us, from the buttonholes and the hair combs to the flower heart and the delicately arranged ivy along the aisle. You managed to capture our exact vision every time. Everyone LOVED my bouquet and smelt amazing and was exactly the right size! The colours of the flowers just pop in every single photo. I know you are a fan of recycling so I know you will be pleased to her that I used the heart from the portcullis as our Christmas door wreath this year! Thank you ever so much for playing such an important role in our wedding and for your contribution towards making the day as beautiful as it was. Hi Suzanne, We are currently on our honeymoon but I just wanted to say a massive thank you for the stunning flowers at our wedding. Everyone commented on how stunning the venue looked and the beautiful flowers were such an important part of bringing together our colour scheme. You have been amazing from when we had our first appointmnet right up until the day and I really can't thank you enough. It makes you realise just how important wonderful supportive suppliers are when you have your own wedding, and I will be highly recommending you to everyone I know! We just wanted to say thank you so much for our flowers, everyone was saying how good they looked, you really did an amazing job and we will definietley be recommending you to others in the future. Thank you so much for the beautiful flowers you put together for our wedding. Seeing all the flowers in place at Nettlestead on the day was even better than we could possibly have imagined and we were delighted withthe English Country Garden theme that they created. We LOVED the flower arch and also how you incorporated flowers with particular significance to us into all the arrangements. The buttonholes and corsages looked just how we wanted, I absolutely loved my bouquet and the bridesmaid's bouquets as well. It was a real joy to work with you and both Mum and I really enjoyed meeting with you to discuss flowers and colours. Thank you for taking so much time to get a thorough understanding of what we were looking for. Thank you for providing such amazing flowers on our wedding day. Suzanne fully understood exactly what I wanted even though I didn't know the names of the flowers, she just knew what I wanted and what would go well with our venue. She gave us so many ideas for what we could do in our budget. Such a lovely lady, nothing was too much trouble for her. I loved my bouquet and the bridesmaid's, mine was so special. Thank you for doing the extra buttonholes at such short notice, so sweet of you. We were so happy with everything you did on our wedding day and we will definitely recommend you to our friends and family. Suzanne really is a flower fairy! I am sure magic is sprinkled all over her flowers! A very talented lady with an exceptional colour palette and understanding of floristry. I decided to use the Flowersmiths for my wedding as my best friend also used her and I knew her work was very good! I was blown away by the flowers you created for our special day and I wanted to say thank you. You listened to what we wanted and were so helpful with your ideas and mood boards. Thank you for adding tiny details for us, it really did make it all come together perfectly. amazing work Suzanne and I will 100% recommend your work to anyone. Dan and I just wanted to say thank you so so much for the AMAZING work you did on our flowers last Saturday. From the bouquets to the decorations on the Gazebo, everything was beyond perfect. And the tipis really were something else, I was blown away by how good they looked. we had so may compliments on all the floristry work even the staff at The Gardens commented on how good everything looked. Needless to say I will be recommending your work to anyone and everyone! Thank you again for making our day look so fantastic and for being such a pleasure to discuss everything with. We would like to thank you wholeheartedly for all of the beautiful flowers and for saving the day so spectacularly - we will be forever grateful. The floral arch was so, so beautiful, our guests were wowed and we received so many compliments! I could not have been happlier with my bouquet, it was even more beautiful than I imagined it would be - I didn't want to put it down! I just wanted to say a huge thank you for the flowers from Saturday. They were all absolutely amazing, beautiful stunning! I couldn't have wished for them to be any better! In particular the most outstanding for me was my bouquet, I just wish it would last forever. The attention to detail with the men's pins and pearl bracelets for the corsages were most appreciated. I can't thank you enough in helping to have made our day more than perfect. Suzanne and team, Thank you for all your help and support with the flowers leading up to our wedding and for the most beautiful flowers on the day. They were exactly what we wanted and were just so stunning. The day certainly wouldn't have been the same without them. You are very talented at what you do and we cannot thank you enough! What can I say. I just wanted to say a massive thank you for my beautiful flowers and for coming to my rescue in that hot weather. You honestly did get it so right, from the colours to the style it was unbelievable! and we had so many compliments on it all. The table setting looked out of this world and we were just so so delighted. You have been the best florist we could have asked for. And I appreciate more than you know coming to the venue last minute to sort my bouquet, you honestly are amazing.I think the flowers are going to come out great in the pictures and I have copied you in a sneak peak! We wanted to write and say thank you for preparing such beautiful wedding flowers for us! I loved how fragrant the flowers were, particularly my bouquet, and the flower curtain was fantastic! 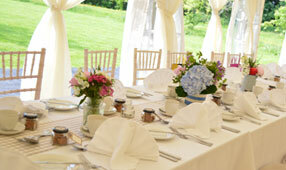 We also loved the greenery in the marquee, thank you for putting that up. The buttonholes and corsages were all well appreciated! My hairdresser said how well put together the flower crowns and hair comb were and they stayed in tact all day. We really were delighted with all the flowers. I just wanted to say a HUGE thank you for creating such beautiful flower arrangements for our wedding day! The room looked absolutely stunning and the flowers were incredible! We have received an unbelievable number of compliments on how beautiful it looked and how overwhelming the table flowers and bouquets were. We are beyond thrilled and appreciative of everything you did for us! I just wanted to drop you a quick note to say Thank you! The Flowers were amazing, I loved the bouquets but the table runner arrangements just really made it! We kept most of the flowers until the week after and have pressed some from my bouquet. Will send some photos when we have them. Thank you! Wow! What can I say! Everything was so perfect and pretty! Thank you so much, my bouquet was beautiful and the flowers around the table plan blew me away! Thank you! Dear Suzanne, We just wanted to say thank you for the beautiful flowers for our wedding. We have had so many wonderful comments and they looked amazing! I still have my bouquet, rather dried out, but I can't bring myself to throw it away! Dear Suzanne The flowers were spectacular and we have had so many positive comments from guests. The colours were just right and the gate arches were very effective. Many thanks for all you did to help make Ben and Helen's day so special. Andy (Father of the Bride). Hi Suzanne, just wanted to say thank you so much for the truly amazing flowers. They blew me away, they were even better than I had imagined and my bouquet was perfect with my dress. You are such a talented lady. Just a quick note to say a massive thank you for my flowers! They were just beautiful and everyone said how lovely they were! I honestly can't thank you enough, from the lovely (and calming!) biscuits and tea to the gorgeous lantern arrangements on the day, you have been amazing throughout, thank you so very very much! We wish you all the luck in the world going forward with everything , will be sure to follow you on pinterest and see what's next on the creative plan! Dear Suzanne Thank you so much for helping make our day so special. It was so nice to meet you and have your amazing talents make the undercroft, bouquets, buttonholes, milk churns and marquee stunning. The hanging flower chandeliers were incredible. It was a real pleasure working with you and people still compliment you on the flowers.We hope to send some pictures soon. I just wanted to say a huge thank you for the stunning flowers you provided for my wedding on the 9th July. They really took my breath away!! So much more stunning than I could have imagined and they matched the theme perfectly. Thanks for making it so perfect. Thank you from the bottom of our hearts for your spectacular wedding flowers The flowers were stunning and made our dream wedding! I was extremely impressed with the professional service we received from start to finish. Thank you for guiding us through the process, it was so nice to work with you and see the amount of passion you had for making the flowers right for our day. When we visited you, you made me and my Mum very welcome and at ease. You managed to put togethr an amazing collection without a lot of direction from me and made sure I was able to have the flowers I loved, and made it work in my budget. I loved the mood board you created! As a bride you have so much to think about and plan and when I came out of my first meeting with you I knew I wold not have to worry anymore about the flowers. When we first saw the fllowers within the grounds of the venue it took our breath away, they looked spectacular! I could not recoommend you highly enough! Thank you so much for helping towards our dream weding day! Dear Suzanne, your flowers were so beautiful and absolutely perfect. Thank you very much indeed. The bay trees made such a good divider from one roon to the next, the pedestal was just right for the harpist's alcove and all the other flowers went home with very happy new owners. We too were more than delighted. Another big thank you!! 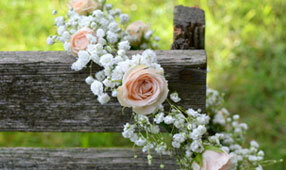 We knew from the minute we met you that we wanted you to be our florist for our wedding. We have followed you on facebook and seen all your amazing creations so we were excited to see our bouquets, centre pieces, Church decorations and table plan! The meeting to discuss our flowers was so informative and relaxed that we came away knowing that our flowers would be out of this world. We knew that if Claire recommended you, you would be a lovely person and you really were so lovely to us as well as being such an amazing florist and creative artist! Thank you so so much for our beautiful flowers! We knew they would be good but they were even better than we could have imagined.!! We both want to say thanks a lot for the flowers at our wedding.The whole place looked so amazing and the masterpiece really was the archway over the door into the undercroft, That was so brilliant and everyone was commenting on it. The candelabra's were brilliant, the flowers in between the cake tiers, the bouquets, the headdress pieces, the pillars, I could seriously list everything and each was great! Let me know if we can do any thing in the way of photo's or reviews. Just to say our flowers were perfect! Thank you! I wanted to thank you for the wonderful job you and your team did providing all the flowers for our wedding day. From the bouquet to the corsages,to the way you dressed the candelabra - everything was sublime. The flowers were utterly beautiful and better than anything I could have dreamed of. Unfortunately you came and went before I could thank you which again was so seemless and professional. Thank you for helping to make my day so special. We are having my bouquet preserved so that I can admire it and your skill for as long as possible. We can't thank you enough for the amazing flower centre pieces and of course not forgetting the fantstic bouquets!You really captured exactly what I wanted our wedding day to look like. When I walked into the Orangery it really did take my breath away as the room was just so beautiful. It was so lovely working with you and the work you put into each bouquet and centre piece is truly amazing. My bouquet was so beautiful and really suited the look of my dress. I can't tell you how pleased we all were with our bouquets. Our wedding day was absolutely amazing and you certainly had a part to play in that! I will definitely recommend you to future brides! Thank you so much for the wonderful flowers we had yesterday! They were absolutely perfect and exactly what I had hoped for. I am so glad I took advice and got in touch with you! Thank you so much for what can only be described as the most AMAZING wedding flowers, centre pieces, table displays and bouquets ever! I couldn't have wished for a more amazing display of Autumn flowers and I was completely overwhelmed by the beautiful flowers and arrangements. I couldn't have been more in love with my bouquet!! Thank you so much for all the work that you put into them, you really did make the day so special. Thank you so much for the beautiful flowers at our wedding last week. I am sorry that I didn't get to see you or thank you on the day but I am so grateful anyway! I am hoping our photographer got photos of the marquee before the gang of guests decended on it. You interpreted what we discussed perfectly and I couldn't have been more delighted with the result. The bouquets were perfect and exactly what I wanted, my hair comb too fitted with the style again perfectly! All of it just stunning! So thank you very much again and we were both really thrilled with the results. As a highly professional, outstandingly creative florist - and lovely individual, I can't recommend Suzanne enough. As a bit of a frustrated artist myself I was probably a pain to work with and was rather directional. Suzanne was patient, open, hard working and what she in the end produced both reflected my ambitions but actually far bettered them. At my wedding, I couldn't stop gazing at them and my guests were exclaiming how they had never seen any flowers so beautiful. I loved them so much I bought some of them with me on my honeymoon. Suzanne is truly an artist with flowers and I wish I had another event coming up for her to beautify! Just wanted to say thank you so much for doing such an incredible job on the flowers for our wedding. The bouquets were stunning and the garlands were even better than I could have imagined. I just wanted to send you a HUGE thank you for all your hard work in doing the flowers for our wedding last week. The flowers were INCREDIBLE. They were exactly what I had wanted but in fact so much better than I could have imagined or described! You did an absolutely wonderful job - my heart was just totally full of joy everytime I saw them and I am currently still enjoying being surrounded by them at home! They reflected the theme of the day and set the tone perfectly.I had so many comments from people on how lovely they were as well. Thanks again and I would not hesitate to recommend you to anyone! I just wanted to say a big thank you for our beautiful flowers that you supplied for our wedding at The Orangery. We were really pleased with them and they looked beautiful. We have the table flowers away as gifts and everyone was vey complimentay and said they lasted for well over a week. Many thanks again. Just to say thank you for helping to create a wonderful wedding day for James and Fiona. The flowers in their various forms were just superb and for once my corsage stayed in place all day!! I shall highly recommend your services to others, thank you again. Dear Suzanne, I cannot thank you enough for the thought and hard work put into our wedding flowers. From our first meeting you really understood exactly what I was looking for. When you came to the barn to drop off the centre pieces I was speechless, they were so stunning and fit perfectly with our decoration and my headpiece. The hops over the arch were so effective and blended in with our country theme. The only thing I was upset about was that I could not keep my bouquet forever!! Dear Suzanne, Thank you so much for providing such gorgeous flowers and bouquets for our wedding day. They were perfect and I loved carrying mine around all day! It was a pleasure to work with you and we're very grateful for your fantastic work. WE just wanted to drop you a note to say thank you for the amazing job you did on our flowers. We absolutely loved all of it, they were perfect! The hops at the church were gorgeoust and the colourful bouquet was absolutely stunning! I was so happy with the way everything turned out. The flowers in the marquee were exactly how I imagined them and the little cake topper was amazing. Thank you Thank you! Dear Suzanne, Many thanks for the wonderful flowers you provided for Clare and Ruban's wedding on Saturday. Every aspect was exemplarary and much commented on by our guests. I just wanted to say a BIG BIG BIG thank you for the flowers you did for our wedding day on Sunday, they were absolutely amazing. If there is anyone looking for a florist to do their wedding flowers, I highly recommend using Suzanne. A Big thank you for the great job done on our weding flowers. 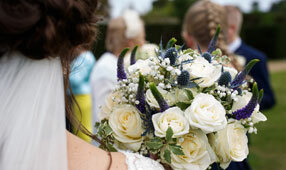 Everything was simply perfect, the choice of flowers, the colours, the foliage and my bouquet was stunning. We got so many nice compliments fom all the guests and everyone was taking pictures of all the flowers and decorations:) Thank you so much again for creating such beautiful arrangements. Thank you so much for the beautiful flowers you arranged for our wedding, it was fabulous and we couldn't have hoped for any more, keep up your stunning work! Suzanne It was so beautiful, thank you so much! We had so many lovely comments on all the flowers! Thank you so much again for our beautiful wedding flowers, they were absolutely stunning and just what we had wished for.! The barn looked breathtaking and so many of our guests commented on your flowers and all those who took home the large vases were thrilled with them. I feel very lucky I found The Flowersmiths, we really couldn't have found a more talented and lovely florist, thank you so much again. Just a note to say thank you so much for the beautiful flowers, you did such an amazing job, they really were perfect! Everyone commented on how wonderful they were and how well presented they were. We had a perfect day and thanks again for all your hard work. Thank you so much for the amazing job you did with the flowers, they were absolutely perfect.The colours were spot on and just wonderful!! we were so pleased with them. Thank you so much for all your help, you were a pleasure to work with. Just a note to say a HUGE THANKYOU for the flowers that you put together for our wedding. I absolutely LOVED my bouquet, so stunning and it looks so great in the photos. The table centres, bouquets and buttonholes also looked fantastic and really added to the marquee, we had so many nice comments from guests about how nice the colours were.Thanks again! I just wanted to say thank you so much for the absolutely stunningly beautiful job that you did with our wedding flowers. Just perfect! You did such an amazing job your flowers really did 'finish the wedding off' and bought my vision to life, I can't thank you enough. I am sorry for such a late message. I wanted to finally tell you how spell-bound I was by your amazing flowers on my wedding day. Honestly I had high hopes but truly your floristry skills made my wedding. My bouquet was stunning and lasted throughout the entire day and beyond. When Colin and I arrived at the Westerham Golf Club we wandered around for a while having photos taken then I looked through one of the windows - it was magical! Beyond my wildest dreams, perfection! Thank you for understanding my visions and for taking it to the next level in beauty. I shall never forget your enthusiasm and passion - any bride would be lucky to have you as their florist. Thank you for everything! Dear Suzanne, Just a quick note to say thank you so much for our beautiful flowers on Saturday. They were stunning and everybody commented on how amazing they looked. As soon as we get our photos back I will send some straight over to you. Thank you again. Dear Suzanne, The flowers for our wedding were utterly amazing and perfect. I could not have asked for anything else and when I saw them I was lost for words as they were so beautiful. I loved my bouquet so much I am currently trying to preserve it. Thank you so much for all your hard work. Dear Suzanne, Thank you so much for your beautiful beautiful flowers and displays. You made our wedding day perfect. Everyone said how stunning everything looked. I will certainly be recommending you to everyone as not only are your flowers beautiful but you are lovely too. Thank you again for EVERYTHING! It all looked 'out of this world'!! How can I make my bouquet last as long as possible??? A HUGE thank you for the beautiful flowers you supplied for our wedding. Everyone commented on how beautiful they were and they were exactly as I hoped they would be! Thank you again Suzanne for what I consider to be 'the' most beautiful flowers for our wedding. Truly stunning! Dear Suzanne, thank you so much for all you did and for the wonderful flower arrangements and bouquets that you did for Kate's wedding they were beautiful and just what she wanted. You made it seem simple and from our first meeting took the time and thought to produce picture boards to ensure you understood Kate's wishes, and we were not disappointed. The arrangements showed such flair and were much commented on and the roses you chose couldn't have been better. Suzanne the flowers were truly stunning!!! They were everything I knew they would be- I absolutely loved them!! The one in the reception venue was just gorgeous. I can't tell you how delighted I was. You are a truly talented lady and my goodness I am so glad you managed to squeeze me in. Thank you sooooo much! I wanted to say a huge thank you for all your hard work with the flowers with our wedding. They really were perfect. We had so many comments on how lovely they looked. I was really pleased how well you managed to capture both of our personalities in the flowers. My bouquet was beautiful. Suzanne, you positively excelled our expectations, your creations were stunning and you have been a PLEASURE to deal with!!! You are a very talented lady, the candelabra arrangements were amazing, my hairdresser said they were the most beautiful flowers she had ever seen!! I have given them away to friends and family, too beautiful for people not to enjoy them. Thank you!!!! Hi Suzanne, I just wanted to send a quick email to say that the flowers looked amazing yesterday. They were all so pretty and exactly what I wanted. The colours looked great with the bridesmaids dresses as well. They turned out even better than I had imagined. The flowers on the ceremony seats also looked brilliant. They were just the right size. I thought the mixture of candlesticks and rose bowls worked so well in the pavilion as well.Thanks again. I couldn't have asked for nicer flowers. I even loved the lace on my bouquet. I will send you some photos when I get them. Thank you so much for the flowers they were absolutely beautiful, I was so thrilled with them. I have recommended you to a friend who is getting married this year. Thank you so much as the flowers really added to the day to make it so special. Hi Suzanne, I have to say how overwhelmed I was by how beautiful the flowers were and they were one of my favourite things about the wedding. You totally understood the look I wanted to create and they were just perfect. It was a pleasure to work with you too. I will definitely be recommending you to all my friends. Thanks so much Suzanne!! All the flowers were absolutely amazing, the best day ever!! Loving all the pictures. Thank you so much for our flowers on our wedding day, when we walked into the reception venue they completly took our breath away, so many people commented on them and they really helped to make the room look fantastic. I am so pleased we choose the highup stands they just looked beautiful exceeding my expections fully. Thank you for all of your work for the day. We were so pleased with all our flowers they were absolutely beautiful, thank you. I just wanted to thank you so much for all your wonderful work and help which really was the icing on the cake for making the day so special. I absolutely adored my bouquet, it was utterly perfect, size-wise, choice of flowers etc - I loved it! It still looks beautiful nearly two weeks on! I just wanted to say a huge thank you, the flowers were amazing. We only just had to throw the pedestal flowers away (3 weeks since the wedding). Thank you so much for all your hard work. I just wanted to say a huge thankyou for our flowers they were absolutely stunning- more beautiful than I could have hoped for, they were just prefect and you got exactly what I asked for and even more! Such a lovely mix of colours and varieties of flowers - simply divine! I wish my bouquet could last forever! Thank you so much for surpassing our expectations with your flowers. They really brought together the entire colour scheme of the wedding. You managed to capture the gorgeous two-tone vintage creams and pinks that I found so hard to describe. They were one of the best surprises of the day! Thanks again, Anna. I just had to say how wonderful the flowers were at H and C's wedding and everyone commented on them. As a garden designer you will appreciate that this aspect of the wedding was very important to me and you really delivered - well done!I will be recommending you to everyone who is looking for stylish and original flowers for their special occasions. We just wanted to thank you and your team for the fantastic job you did on our wedding flowers. The effect was truly stunning, the colours even better than I wished for, the flower choices perfect. There was so much wonderful praise for the flowers and quite a fight for them by my aunties the next day! Thanks for creating such a 'wow' effect. Thank you so much for all our beautiful flowers! Hever looked fantastic! We had the most magical day! Recent news and things that interest us!